Another point of interest is Italian WhC development over the years. In the first phase, most of the projects were related to buildings with deemed savings as energy savings assessment method. Then the industrial sector rose constantly, till covering 80% of the savings in 2014, mostly assessed through metered savings procedures. 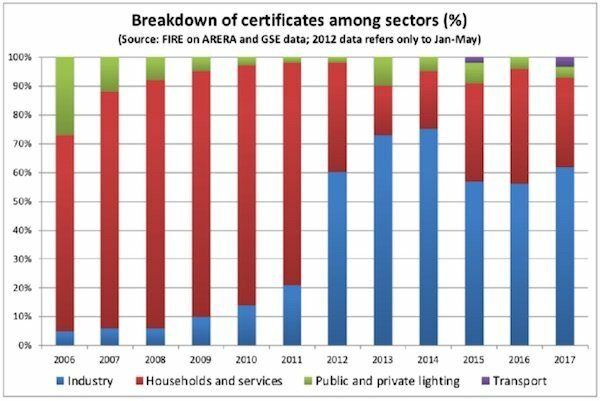 In the last three years, the buildings sector has started to recover, while metered savings have remained the most used energy savings evaluation procedure. This last development is mainly due to some regulatory decision and to the modification of the assessment of additionality for many industrial projects categories. The paper will illustrate the reasons behind these developments, the issues that have arisen over the recent years, and the decisions taken to address them through a major redesign of the Italian scheme that has been introduced with new ministerial guidelines in 2017: many aspects – such as targets, baseline and additionality, saving assessment, and measurement, verification and control procedures – has been deeply affected. The presentation related to the paper presented at eceee industrial conference, covers such themes, focusing in particular on the industrial side and highlighting themes like cost effectiveness, energy savings assessment, and how baseline and additionality have been dealt with over the years.